من با توجه به تخصص نداشته ام! در مورد مسائل مربوط به کامپیوتر، شبکه ، امنیت شبکه در خدمت دوستان خواهم بود! فقط لطفاً همانطور که فریدای عزیز! هم گفتند keyword(کلمه کلیدی) از عنوان خود ارائه دهید. مثلا گفتن خواستن مطلب در مورد معماری کامپیوتر خیلی کلی است. و مثلاً اگر بگویید که در مورد z80 مطلب می خواهم، در حقیقت کمک کردید که مطالب دقیقتری در اختیارتان گذاشته شود. هر چند دوستان هر چی بخواهند تلاش خود را خواهم کرد. منظور فقط دادن مطلب دقیقتر است و گرنه هر کمکی که ازم بر بیاید،دریغ نخواهم کرد. کتاب خیلی معروفی هست و خیلی از بچه های MBA و Marketing میخونند اش اما نمیدونم چرا هر چی میگردم پیداش نمیکنم . Do you know the six stages of successful marketing research? Find out with MARKETING RESEARCH: METHODOLOGICAL FOUNDATIONS. Inside you'll learn about all stages, plus how to make them work for you in real-world situations. This textbook continues to be the market leader because of its balanced coverage and its easy-to-understand presentation. Get a solid foundation in class and preparation for the future. 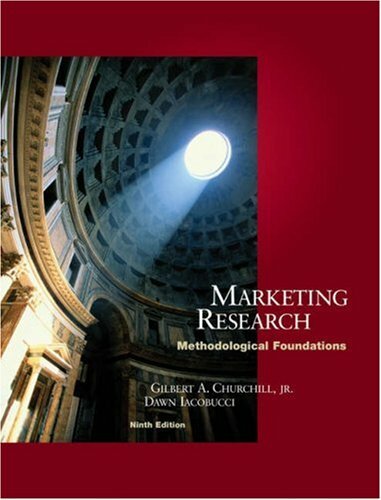 This book is an excellent introduction and advanced resource for all those that wish to be a marketing research professional (or to those that just want to understand it). The authors present in-depth explanations of the field's theory populated with day-to-day examples. Part 1: Marketing Research, the Research Process, and Problem definition. Part 2: Determine Research Design. Part 3: Design Data-Collection Method and Forms. Part 4: Sample Design and Data Collection. Part 5: Analysis and Interpretation of Data. Part 6: The Research Report. The book fits academic as well as industry readers and the content justifies the price. This is the new edition of the book we used in the marketing research course at the Michigan Business School. It was great then and is even better now that they have tightened it up and slimmed it down a bit. It reads clearly, is focused, and doesn't pull any punches about the benefits, tradeoffs, and limitations of the various problems and methods involved in this subject. Rather than focusing on decision support systems or marketing information systems, this book is focused on a project based approach. The authors help you recognize a problem, how to formulate it clearly, present it to decision makers for approval, designing the research to be done, data design and collection methods, they offer sample designs which is very helpful. They then do a fabulous job on data analysis and conclude by showing you how to present a proper research report. There are several helpful appendices providing statistical values for those calculator based problems, but, really, who doesn't use a spreadsheet or SPSS or some similar package anymore? There is also a glossary, a subject index, and an author index. This is a standard text on the subject, and it is terrific. Summary: Expensive but worth every penny! This is a huge work of marketing research, both in terms of volume and importance. Although intended as a grounding in the foundations of market research, the book takes you further than that. As a result I was using it as a text at post-graduate level. The book sets out to explain how to: Formulate your problem. Determine your research design. Design your collection method and forms. Design your sample and collect the data. Analyse and interpret the data. Prepare your research report. It is then subdivided into sub sections. I was particularly impressed with the section on ethics, which was so clearly laid out that I used it as a guide when writing a pure ethics paper. The book is amply supplied with examples and case studies to illustrate the text and make it useful in a more practical sense. All in all a clear, accessible, well laid out and well indexed textbook. An excellent work both theory and analysis. Provides an insight about the math requirments for the Marketing Researcher. In certain areas it gives the basic ideas - pp 752,753 - Fig.13.1 Histogram and Frequency Polygon of Incomes of Families in Car Ownership study. The Preface states- this edition, is designed to avoid such extremes by providing the student with a thorough treatment of the important concepts, both simple and complex - This aspect is proved in every section of the book. Really it will help the student to develop their creativie and analytical marketing skills. A very good work. اگر قصد خرید دارید! تشریف ببرید طبقه بالای انتشارات امیرکبیر روبروی دانشگاه یک کتابفروشی تخصصی کتابهای خارجی هست که در صورت درخواست ظرف دو هفته کتاب خرید و تحویل میدهند. ولی متاسفانه خیلی گران تمام می شود. چون کتاب معروفی است، مطمئن باشید نسخه کپی و زیراکس شده آن تو کتابخانه های دانشکده های مدیریت مخصوصاً دانشگاه تهران حتماً پیدا می شود.